As we headed toward the town of Luray, driving away from the Skyline Drive (you can read more about it here! ), the excitement of seeing the magnificent Luray Caverns soon died down, once we saw the crowd and the lines forming at the ticket booths. It was just past noon, and it seemed like all of America (let alone Virginia) had headed there to kick start the weekend. Little did we know that the lines would be much longer and wind past the restaurants and the toy museum a few hours later when we were done! Popular as it was, we managed to find a great parking space. Changing into our sneakers (you never know what may crawl under your foot underground! ), we headed to book our tickets, and waited in line to enter the caverns. People watching has now become my favorite past time- great for me! It beats getting irritated standing in lines- so not a New York moment! 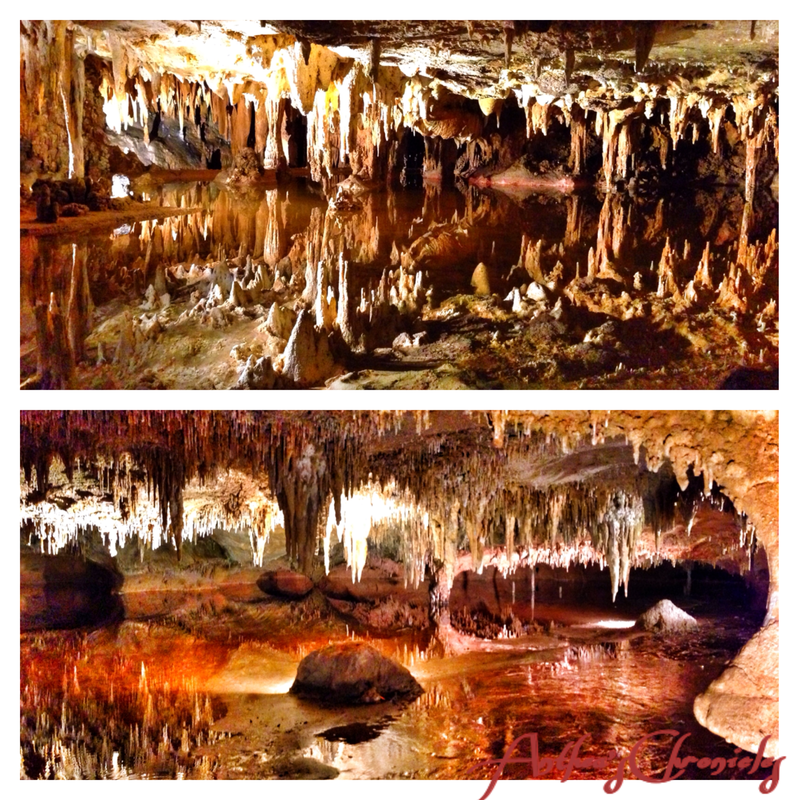 Discovered in 1878, the Luray Caverns are the largest series of caverns on the East Coast of America. The caverns comprise stalactites, stalagmites, flowstone, mirrored pools, columns, etc- making it a great educational day trip for kids. Up until the 1970’s people were allowed to break off and take part of stalactites or stalagmites home. However- there now is a strict ‘do not touch’ policy, as our human bodies emit heat, acids and other substances which react with the formations. On August 13 that year, a local tinsmith Andrew Campbell and a few other men, were attracted to a limestone sinkhole atop a big hill, where a cold gust of air blew out the candle Andrew was holding. The men dug away loose rock for four hours after which the 2 smallest men- Andrew and his 13 year old nephew Quint, squeezed through, slid down a rope and explored the caverns by candlelight.Today, the caverns are lit by electricity, giving the same candlelight effect , that Andrew and his team of men would’ve experienced. The staircase, is the first route (the hole where they slid down the rope) through which the explorers discovered the caverns. As we waited in line to walk down dimly lit stairs we came to the focal point of the first cavern- The Washington column in honor of the first President of the United States. It loomed ahead- mighty and strong, while we its subjects gathered around marveling at its size and formation. 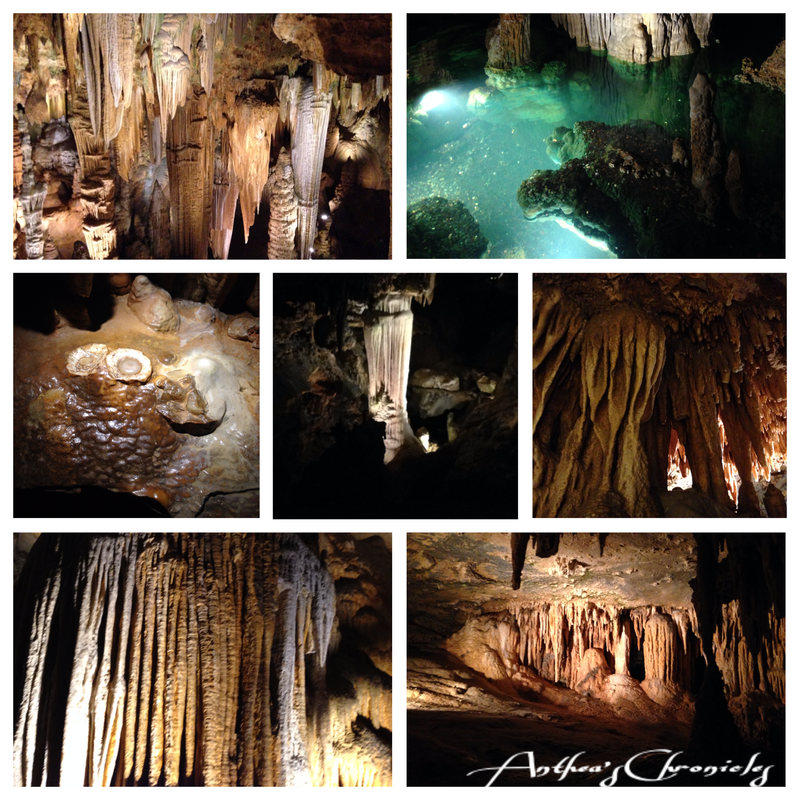 Glimpses of the Caverns, including the wishing well and the fried egg formations. 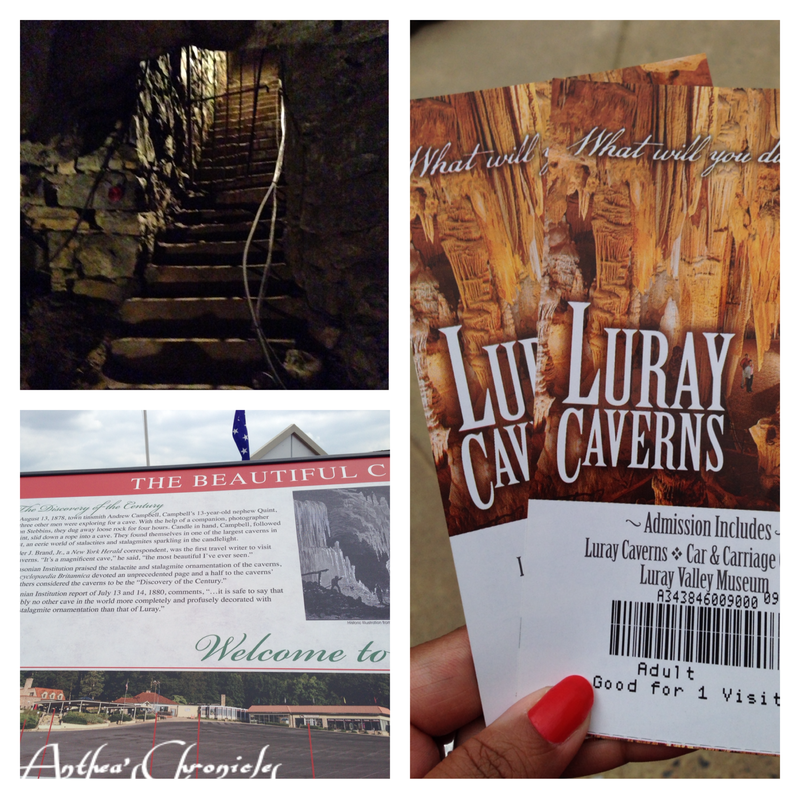 The path that goes through Luray Caverns starts at the entrance. It then curves throughout the caverns until you reach Dream Lake, going in circles downwards until it reaches Saracen’s Tent. It then goes right to the famous Stalacpipe Organ- for which the caverns are best known. The Organ is a lithopone made from solenoid fired strikers that tap stalacittes of various sizes to produce tones similar to those of bells playing though the caverns. We reached just in time for one of the staff to start up the organ. I was disappointed – maybe expecting too much is not a good thing! It was soft and a few minutes long. Once done from there, we passed a wishing well the proceeds of which are donated to various charities in the county – that’s such a brilliant idea. Once done, we passed a sign where veterans from Page County were honored and then finally went through a small passage to see the famous ‘fried eggs’ formation. Tour over- the path led us back to the entrance through which we climbed down! Note: Other that that set of stairs, it is very stroller friendly as there are pathways (some of them a little steep- but manageable all the same). The entire trek is 2.4 kms and takes around an hour to complete. The Caverns were ‘magnifique’- As we walked through them taking in every aspect and bits of details imparted by staff placed at various intervals, the mirrored pool took our breath away. One wonders how nature works her magic, weaving her way under the surface of the earth, creating works of art, unbeknownst to man! I visited Luray Caverns many years ago. Your beautiful images reminded me of my tour.